This cave is located at the top of Payudan mountain, exactly in Payudan Daleman village, Guluk guluk district, It is about 30 km through west of Sumenep. For Sumenep people, payudan cave is important. 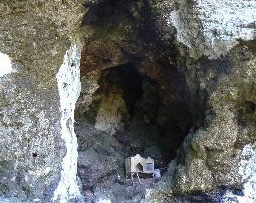 This cave has related with king Sumenep history in 14 to 17 century. This cave is not only a tourism site, but it consists of religious historical. She is the daughter of Prince Soccadiningrat II, a Sumenep king that rule about 1366 till 1386, at that time the royal palace was still in Banasare village, Rubaru district. Potre Koneng husband was king in Sepudi, his name was Adi Poday( 1399-1415) and he was a grand son of Sunan ample in Surabaya. The was the prince with title of Prince Soccadiningrat III, the King of Sumenep in 1415-1460. He was the elder son of Potre Koneng and Adipoday. According the story Jokotole was very respected by many people because of his supranatural power. This is proved during Majapahit era, when Jokotole defeated Blambangan kingdom, and he was become the son in law of Majapahit kingdom, King Brawijaya. The king of Sumenep in 1749-1750. He passed away while he was battled against the king in Bangkalan. Ki Lesap was the generation of Bangkalan.